Recently we blogged about the benefit of paying credit cards before the statement date. Here are some additional general "common-sense" things you can do to improve your credit and FICO score before applying for a mortgage. First, always keep a "cushion" on your credit cards. 30 percent of your credit score is linked to "Amount Owed" and a big part of Amount Owed is a raw calculation of (1) What you owe in dollar terms, against (2) How much credit you have at your disposal. The credit bureaus want to see at least 70% of your credit "available". If you can keep your cards at least 70% available, your credit scores should improve. For example, if all of your credit cards give you access to a combined $50,000 and you are using $10,000 of that available credit, you have 80% of your credit available to you and this is "good". Raise your balances to $30,000 and this is "bad". Second, don't make major purchases on credit prior to making a mortgage application. This includes opening a store charge card to save 10 percent or more on a washer/dryer set, for example; or for any other appliance or furniture piece. The reasons why are two-fold. One, store charge cards are often opened with a limit matching your initial charge, rendering them 100% utilized. 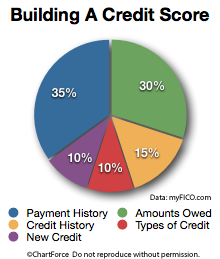 This is bad for a FICO, as discussed above. And, two, opening a new charge cards has a negative FICO impact anyway. Charge cards are associated with high default rates. Third, make all of your monthly payments on time -- even the ones in dispute. You may not want to pay that $80 wireless phone bill, for example; the one that you think you owe, but remember that Payment History accounts for 35% of your credit score. Even one late payment -- or payment in collection -- and your credit score can drop dramatically. It's often less expensive to pay a bill in dispute than to be relegated to a higher mortgage rate. The payment is dispute is remedied today. The payment on that mortgage rate lasts for 30 years. Also... be wary of seamingly benign traffic tickets... even simple parking tickets. If these are not paid, they will almost always end-up on your credit report once a collection agency gets ahold of them. I have seen FICO scores drop by 30-40 points, solely due to unpaid traffic tickets - or tickets that were paid late. If you are planning to purchase a home in the coming months, and have questions about your FICO credit scores, and how they relate to applying for a mortgage, it's best to connect with a mortgage lender who can answer your questions. Of course, you are welcome to contact us as well for additional tips. And if you're looking bo buy a home in the next 1-3 months, DO NOT DELAY - working with a lender today to get pre-approved! You will be saving yourself a lot of frustration when it comes time to search for a home and make an offer.